Calvin Martinez is our favorite ringmaker because of his unique designs and the exacting workmanship that he brings to the fine details of his rings. No two of his rings are exactly alike and the stones he uses in his pieces are of the finest quality and particularly well cut. 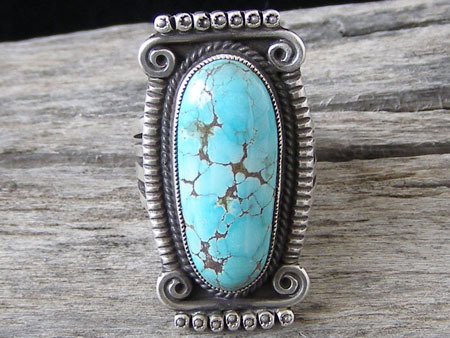 Set with a long, thick oval of natural, untreated Carico Lake turquoise, this ring is beautifully decorated. The border of the ring face is edged by long arcs notched low-dome wire, scrollwork and a row of raindrops above and below the stone which were stamped by a handmade hollowpoint dot stamp. The shank is stamped on back and splits into four separate bands which attach to the ring back. Hallmarked "C.MTZ" inside an arrowhead and stamped "Sterling". Stone: 1 1/8" x 7/16"
Ring face: 1 1/2" x 3/4"